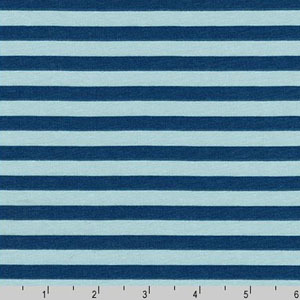 Navy and aqua blue stripes on jersey knit fabric. Each stripe is about 1/2 inch tall. 4-way stretch. 95% Cotton and 5% Spandex. 5 oz per square yard. Medium weight. 59 inches wide. From the Blake Cotton Jersey Fabric Collection by Robert Kaufman Fabrics.